Exquisite handmade dolls by Ohno Hatsuko (1915-1982) will be on display at the Centro Cultural Hispano-Japonés at the University of Salamanca, Spain, from 10 May through to 23 June 2017. Each doll, measuring no more than 30 cm in height, are beautifully crafted with fine details. 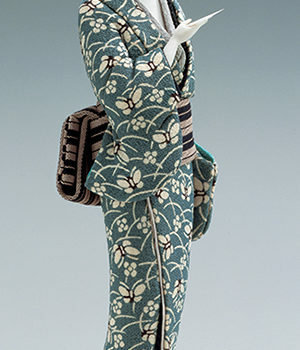 Fashioned in specially made kimonos, they present a unique glimpse into the rich history of artistic doll making that flowered in the 19060s and 70s. Ohno Hatsuko was a young woman who became inspired by traditional Japanese doll making as Japan was rebuilding itself after the war. In her mid 30s, she took lessons from an esteemed female doll maker, Hori Ryūjo, first rather informally in the 50s and more seriously in the 60s. She soon developed her own sensual style with female figures being her specliaism. The women express honest and pure human emotions including of love, happiness and pride. The exhibition will be marked by an opening attended by a special lecture by Ohno Hatsuko’s daugther, Mori Mika on the evening of 10 May. Her talk will be followed by a tea ceremony demonstration by tea master Uchino Sōkun. The exhibition is co-organised by the Sainsbury Institute for the Study of Japanese Arts and Cultures and Centro Cultural Hispano-Japonés. It is supported by the Embassy of Japan in Spain.